The Witch was what I decided to go to this weekend and sadly, I made a bad choice. It was highly praised on other sites as the horror flick of the year. But much to my dismay, it didn’t grab me nearly as well as other scary movies. Sure it made me jump every now and then but the real scary parts weren’t until the end of the flick. Throughout the middle there was some weird stuff but it still didn’t grab my attention. What I did not like about this movie was the Old English dialogue they used, as in “thee” or “thou” — like reading out of a Bible. You had to really focus on what they were saying and what the words meant. Another part I didn’t enjoy was too much talking and not much scary action. Sure the story got out what it wanted but I wish I got scared more and wish “the Witch” was shown more. What I did like was the sound of music which made each scene a little more tolerable and the noises to add the effect of the creepiness. Although the Bible talk was hard to comprehend, the actors' delivery of it throughout was impressive. 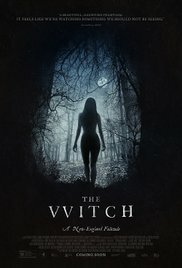 The Witch is a different a horror movie than I’m used to. It had the feel of an old Salem Witch trial kind of story. In the end, you find out who is the leader of the Witch but sadly that was too little too late. If that said person was shown earlier it might of sparked my interest but it didn’t happen. I would wait for the DVD release to see The With or suggest you go watch something else.